A combination of luck and choice of school brought me to TechChange. My first stint at TechChange (a one-week “externship” in mid-January of this year) came through a program at Swarthmore that connects students with working alumni, and I was fortunate enough to land at TechChange, where two alums currently work. 2. Why did you choose TechChange to spend your summer? Put simply: to come back! My time at TechChange in the winter, however short, exposed me to a great deal of what makes TechChange so special as both a company and a place to work. In just one week, I had the opportunity to work closely with both the development and e-learning team to design a course gamification system, and picked up enough of PHP and the WordPress web platform to begin implementing it in the course platform. Along the way, I’d gotten little glimpses of how the teams worked together in the old office, and how nearly everyone seemed genuinely interested in the work their co-workers were doing just five feet away. After a software engineering course in my spring semester, I became interested in the software development process, and how teams use version control and process models. My short stint in the winter wasn’t quite long enough to really delve into TechChange’s processes, and so I wanted first-hand experience working as a full member of the team. In addition, after doing mostly Android app development in the spring, I was eager to try my hand at some full-stack web development, applying both my Python and newfound PHP skills in the live web applications developed by TechChange. Academically, I’m a computer science major interested in software development and process models. Outside of work, I’m a soccer-loving geek with a passion for food! I also enjoy biking and reading good science fiction novels. My time at TechChange gave me the chance to dive into web development and learn about the multiple different frameworks the TechChange developers use. Working through TechChange’s version control and software development processes (weekly priorities meetings, gitflow, etc.) allowed me to see first-hand the benefits and pitfalls of working as a team. DC is a very bike-able city, and so I found myself biking both to work and around the city to pick-up soccer games, intern events, and even food truck festivals! TechChange’s flexible hours definitely gave me freedom to explore, and I wouldn’t have found that at another firm. I was involved in numerous technical projects that the TechChange tech team had in their plans for the summer. The first few weeks of my time at TechChange were spent familiarizing myself with the different apps and architectures that have been developed with Django, and embarking on small bug-fixing projects to get my hands dirty with them. I also aided in testing and updating to new versions of software in use. Later on, as a re-design of the gamification system I implemented in winter, I began work on an event-tracking system for WordPress using the Tin Can API. This became my largest project in the latter half of my internship, and with the creative license to design it however I wanted, I took to it immediately. Many things! I learned that big screen TVs in the office are invaluable during the World Cup. I learned that “Beauty School Valedictorian” is a great band name. I learned that my feet are not built for the wear and tear of working at a standing desk. Throughout the summer, it was evident how much focus was placed on being not just a technical enterprise, but one for social change. Guest experts would cycle through every week, and each project I learned about from talking with people around the office was a part of a larger societal mission – whether it be developing malaria diagnosis training modules for USAID or providing peacebuilding training to international development professionals. It was very exciting to see that our work was ultimately not just profit-driven, but also mission-driven. In one way, yes! I’ve gained a plethora of new skills, and leave with a much-expanded practical knowledge of full-stack web development. But I was also pleasantly surprised by how much larger it seemed – in between my two stints, the company moved its offices to a larger, more central location. There were many new faces I met, but everyone welcomed me back as part of the team. 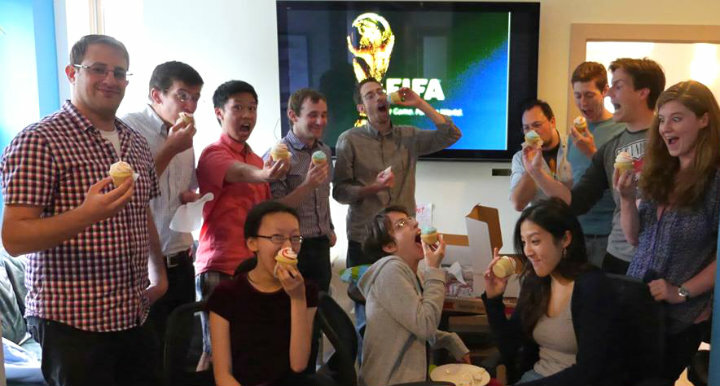 Learning more about everyone’s role on the team through weekly show-and-tells was great, as were the occasional office fun days (full of World Cup viewing, cupcakes, and board games). Of course! There are so many exciting projects that TechChange tackles each week, and the people in the office are an intelligent, diverse bunch who are as committed as they are fun to be around. The work TechChange does leaves a real societal impact on both their students and what students do with their knowledge – something very important to me. Find ways to engage with the people around you in the office: They are all sharp, interesting folks and the office banter is always lively. The projects that everyone works on are all so different, but the way they come together in our weekly show-and-tells is pretty cool to see. Explore the city around you: Washington DC just topped Forbes’ list of “America’s Coolest Cities” – from my experience here, that has definitely rang true! There are many hidden gems in the area to be discovered; Will recommending me a secret taco joint in the neighborhood comes to mind. Being here during World Cup season has definitely helped – DC is also ranked as the best place in America to watch soccer! Interested in applying your coding and programming skills for social good? 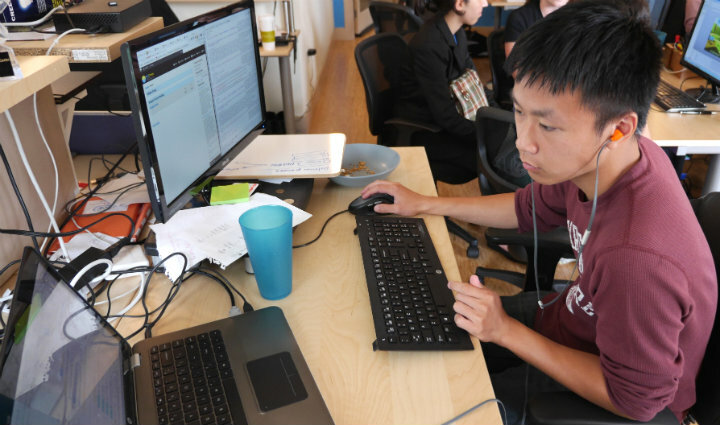 Apply to be a Junior Programmer at TechChange here.